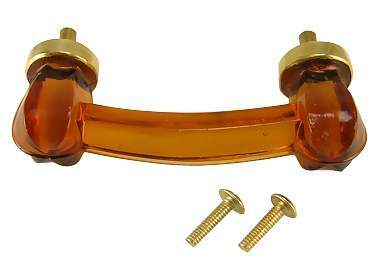 4 Inch Amber Glass Bridge Handle (Polished Brass Base). This pull measures 4 inches from edge to edge with 3 inch (76.2 mm 3.00 c-c) mounting holes. Coordinating and larger knob is also available. Note: the larger knob has significantly thicker glass and, as a result, may appear slightly darker.